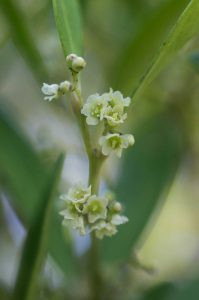 There are few true trees at Phillipskop but in the Waterfall Valley, one tree is common, the Rock Candlewood, Maytenus oleoides. 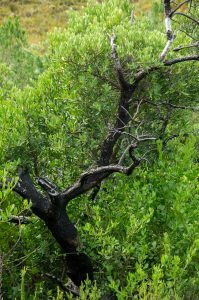 Most trees are unable to survive the regular fires that sweep through fynbos every 10 to 20 years. Forest patches in the Cape are confined to very wet areas or steep-sided rocky slopes and valleys. Rock Candlewood is unusual in that mature trees can survive a fire in their vicinity. 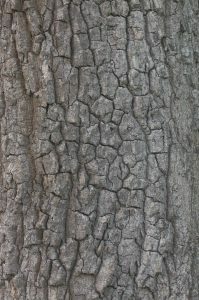 The bark of Maytenus oleoides is adapted to withstand fire. It is spongy and thick, rather like the cork oaks of the Mediterranean. When a fire comes through, it may scorch the top growth but the underlying cambium (the living part of tree underneath the bark) survives and is able to generate new growth once the fire has passed. As the outer twigs and young growth are intermittently burnt off, Rock Candlewoods produces rather stunted twisted branches. The tree forms a distinctive shape of thick branches underneath a rounded canopy. The profile of the branches is enchanting. One can imagine a tree like this growing on the edges of Mirkwood or Fangorn. Our Picnic Tree is a particularly fine example of Maytenus oleoides and you will see other ones up the valley. 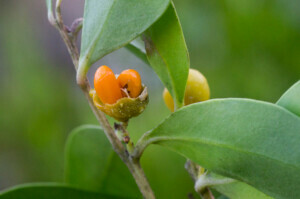 Maytenus oleoides is also a great bird plant. 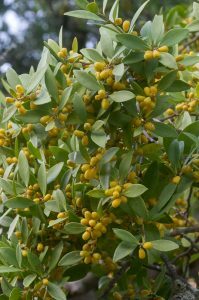 The flowers are not very significant but the yellowish-green fruits that follow split to reveal the seeds. Each seed is surrounded by a bright orange aril, which is loved by birds. Furthermore, in an area that produces very few trees, it acts as a shelter and food source for many insects. Thus the tree also attracts insect-eaters such as Cape Batis, Cape White-eye and Paradise Flycatcher into its boughs. Hence, our Picnic Tree is one of the best places on the reserve to stop and look for birds both on the rocky slopes around and in the boughs overhead. The English common name has a rather confused origin. The Afrikaans name is Klipkershout, on account of its similarity to Kershout, Pterocelastrus tricuspidatus. The leaves of the two species are so similar, that without fruit it is hard to tell the two species apart. (Maytenus oleoides is usually found in rockier areas; “Klip” meaning rock.) Kershout is often translated candle-wood but there is no evidence that either species has anything to do with candles. Rather, the Afrikaans word is derived from the Dutch for cherry and this appears to be a much more likely explanation. The wood of Pterocelastrus tricuspidatus was considered similar to cherry-wood, and the leaves of Maytenus oleoides considered similar to Pterocelastrus. The Waterfall Hiking Trail takes you to the valley with the Rock Candlewoods. 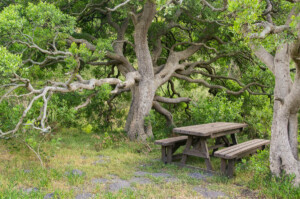 The best example is our Picnic Tree, but there are other large trees scattered alongside the stream. The tree at the entrance to Phillipskop Cave is also a Rock Candlewood. Most of the trees are wonderful for climbing but please be careful not to damage the bark – it is the tree’s survival strategy for when the next fire comes through. December, February, January, kershout, klipkershout, May, Maytenus, Maytenus oleoides, rock candlewood, summer. Bookmark.